Former Affton residents and nomadic van dwellers John and Jayme Serbell have organized a festival for those with wanderlust. A new festival for nomads just might finally prove that all who wander are not lost. This weekend, hundreds of travelers will set up camp in the wilderness near Rolla, Missouri, for the first-ever Midwest Vanlife Gathering. Organized by former Affton residents and current van dwellers John and Jayme Serbell, the event aims to build community for regional rovers. 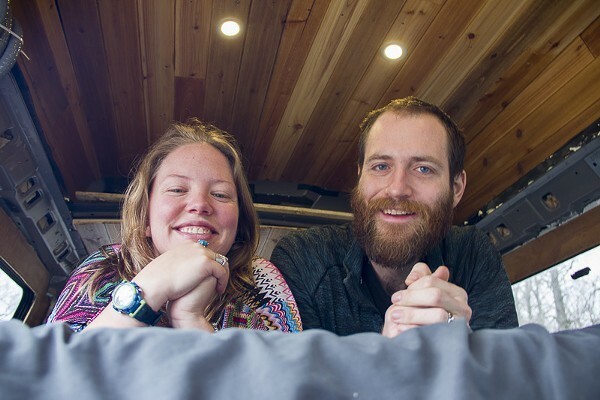 Since Riverfront Times featured the Serbells in a 2017 cover story about trading their suburban existence for a life on wheels, the couple has been on a nonstop journey around the country in their custom-built conversion van. With their belongings — and their dogs! — squeezed into about 200 cubic feet, the Serbells have done yoga in the mountains, splashed in oceans and slept under desert stars. They even recently sold their former home in Affton after initially just renting it out while they traveled. But as much as they’ve enjoyed quality time with each other, the Serbells are even more excited when they can meet up with other home-free travelers. 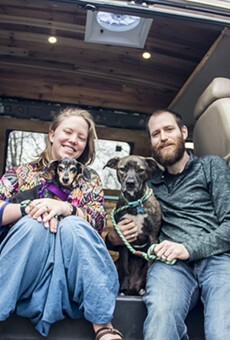 That sense of community is what prompted the couple to organize the Midwest Vanlife Gathering. "Most of our communication with people in vanlife is via Instagram, but since we created the Facebook event page, there's people from all over the place saying, 'Oh, we're so excited! We're building a van in Kansas City and can't wait to come out for inspiration.'" Jayme Serbell says. The Midwest Vanlife Gathering is an offshoot of a series of gatherings by popular Australian rovers Vanlife — the first in the Midwest. 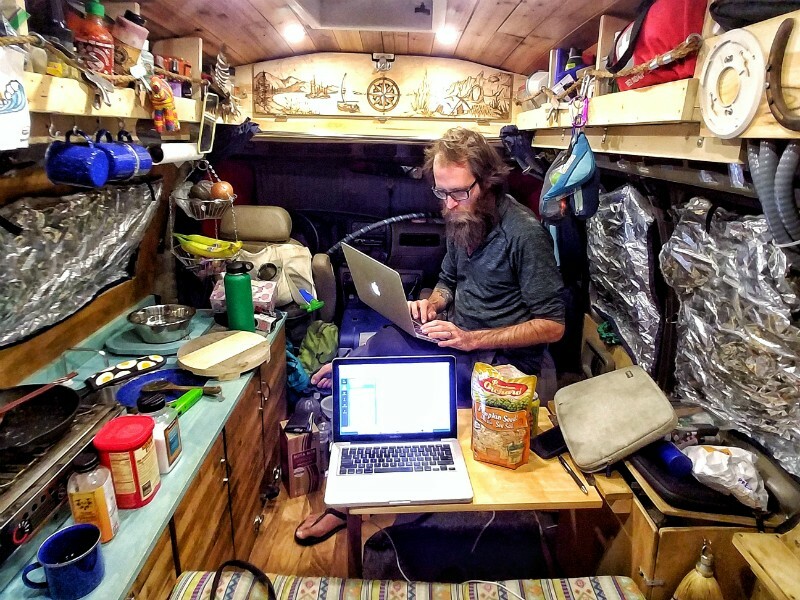 Immersing themselves into global van culture over the past couple of years, the Aussies had been filming The Meaning of Vanlife, a documentary about the nomad community. At some point, most van-dwellers cross paths with the Vanlife folks in person or online, which is how the Serbells became involved. “This year they’re touring again and debuting the documentary, and they reached out to us to ask if we wanted to host a meetup,” Serbell says. “There are meetups all over the West Coast, there are a couple on the East Coast, but we’d never heard of anything in the middle [of the country] except for in Colorado. So we were like, let’s do a Midwest one! "For some people, they've never really had a reason to come to the Midwest, and a lot of the Vanlife draw is going to experience places you've never been before," Serbell continues. 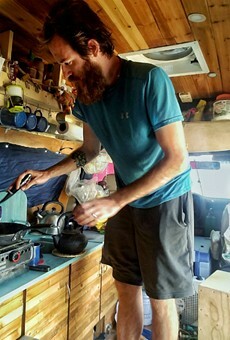 John Serbell works on his laptop after preparing a meal in the van's miniature kitchen. The Midwest Vanlife Gathering will be held in the Slabtown area of the Mark Twain National Forest, with easy access to Big Piney River. The Serbells say that festival-goers can enjoy hiking, paddleboarding, a swap meet, kids’ activities, pet pools, live music, potluck dinners (perhaps inspired by the couple’s United We Van cookbook) and educational activities, along with a screening of the Vanlife documentary. But the festival isn’t just for those who already live in a tricked-out vehicle. The Serbells say the gathering is also designed to appeal to traditional camping fans and give friends who are curious about a nomadic lifestyle an accessible and realistic look at what it takes to hit the road. Van veterans will show off their vehicles and answer questions about build-outs and maintenance. "You don't need a van. You don't need an RV. You don't need a vehicle of any sort. You could just bring a tent," says Serbell. "Imagine camping with 400 of your friends! People typically have their doors open so you can check out their rig, like a big-old open house or block party." A number of event sponsors are contributing camping and lifestyle prizes for a raffle, and 100 percent of the proceeds will go to Adventure Works, a Midwest nonprofit that specializes in outdoor therapy for at-risk teenagers and families. While vans, cars, RVs, buses, bikes and tents are welcome at the festival, participants should note that the experience is “off the grid.” The event site has no utility hookups, generators aren’t permitted and cell phone service largely is unavailable. Portable toilets will be on site. Festival-goers should bring enough water and food to last throughout their stay. Tickets for the May 18-20 Midwest Vanlife Gathering are available for $50 per vehicle driver plus $10 for each additional person. Learn more on John and Jayme Serbell's Gnomad Home website or on the gathering’s Facebook event page.